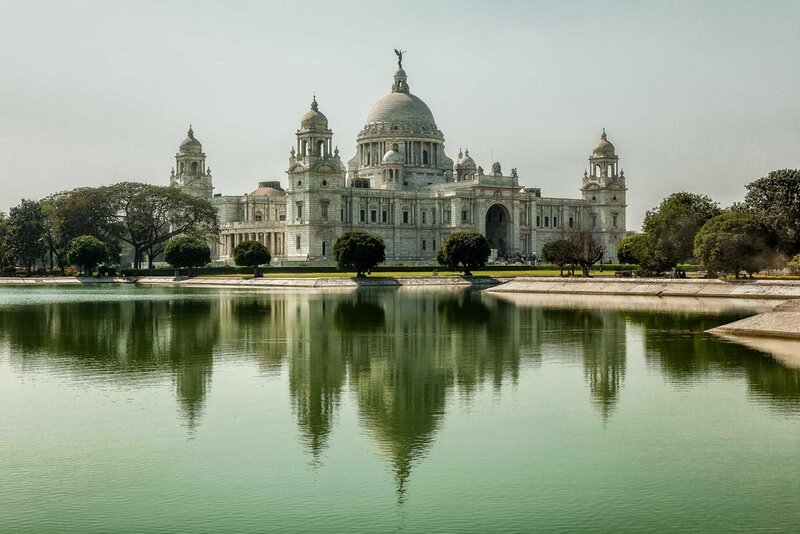 Victoria Memorial and its reflection in the placid waters of a man made lake in Kolkata, India. 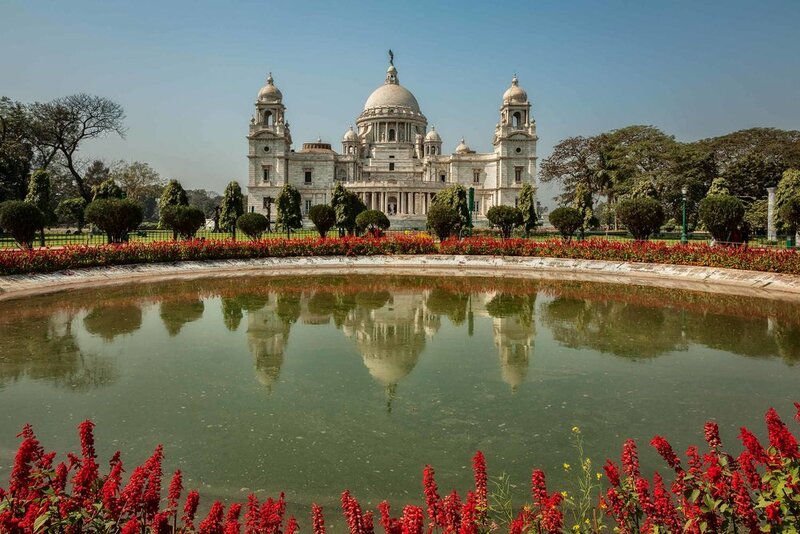 The Victoria Memorial in Kolkata, India is a lovely and historically important building. Sadly, following a range of terrorist bombings, photography inside this and some other important civic and religious buildings in India is no longer permitted. I'm going to assume that this is because by making photographs you have a detailed, visual record of where to place a bomb. Pretty simplistic, don't you think? And while it might be possible to restrict photographers with professional equipment, it's near impossible to stop folks making photos with their smartphones. I guess those good folk who make the rules haven't heard about Google Earth. A statue of Lord Curzon, Viceroy Of India, outside the Victoria Memorial in Kolkata, India. It's such a shame that much of the beauty, majesty and mystery of these wonderful structures can no longer be recorded. the tourist records important moments and memories from their own life's journey as a kind of visual record. This record helps protect against the vagaries of memory and allows us to share our experiences with others. So, as you can see, banning photography is not without cost and there's much that is lost through the implementation of such draconian policies. In some countries authorities seem to be more concerned about video cameras. The trouble is that DSLR and mirrorless cameras sold today include video capabilities and this fact may provide the security guard on duty with yet another reason to challenge your right to photograph the site in question. So whether you use, or even know how to use, the video capabilities on your camera may be a moot point. Of course photographers and tripods can be an issue, particularly where large crowds are present. But so long as the photographer is respectful of the site, and does not willfully impede the progress of other visitors, I don't see a problem. A detail image of columns at the splendid Victoria Memorial in Kolkata, India. I'd heard about the security problems in India, following several bombings by groups that are commonly referred to as extremists, but didn't realize that the response was so severe and so widespread. Frankly, as I travel primarily to photograph, there would be many places that I simply wouldn't visit if I knew I wouldn't be allowed to photograph there. That would certainly be my loss but, given my mission in life is to share the beauty of our world and its people with an ever wider audience, I'd say I wouldn't be the only one to miss out. If photography is the primary reason you travel, you may want to research your planned destinations to ensure you won't be banned from making photos there. It may still be worthwhile making the trip, though it might mean you photograph the location or city in question differently. In the case of the lovely Victoria Memorial, while I was not permitted to photograph inside the monument itself, I was allowed to photograph the building from outside. So, while I was unable to photograph the interior of this spectacular building, one that spoke to the splendour of former British Rule, I was able to wander around the grounds and photograph the structure from several angles. Photographing in the middle of the day, particularly under quite bright light, is not ideal for landscape or architectural photography. Nevertheless, the image at the top of this post illustrates one of my favourite photos from the series. While the building itself is largely backlit the shadows it cast provided a reasonably interesting reflection that repeats the shape of the main dome and surrounding towers. 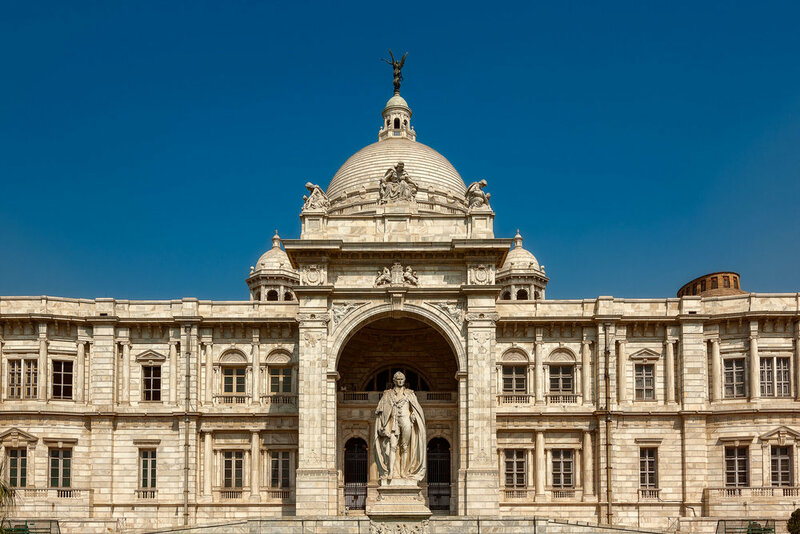 A stone statue appears to stand guard outside the magnificent Victoria Memorial in Kolkata, India. It’s true to say that most folks, generally, don’t like color photographs that display very high levels of contrast. That’s not so much the case with black and white and, when you have no choice but to photograph under high contrast conditions, black and white can save the day. That’s the main reason I decided to render the image of the statue into black and white, though I’ve added a subtle color tone to impart the feeling of warmth into the image. I achieved a similar effect with the image of the columns. In that case I’ve left it in color, but have removed most of the saturation so that, at first appearance, it probably looks like a black and white image. The idea is for the subtle warm hues to add a sense of hope to the images. I hope you like them. Gardens at the Victoria Memorial in Kolkata, India. Travel To India | Is It Right For You? Unless you travel in 5-star comfort India is a very difficult country in which to travel. Nonetheless, its people, culture, temples and landscapes provide the enthusiastic photographer with fantastic opportunities to make truly memorable images. I've been to India on four or five occasions and it never fails to excite me. I've been really sick on each trip, but that hasn't stopped me. It's just the price you sometimes have to pay to experience life at such a profound level.